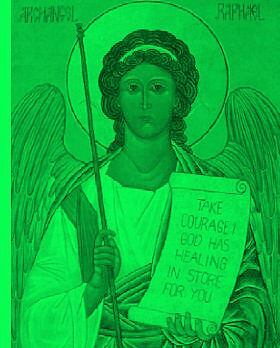 I've written before about Archangel Raphael, but today I thought I'd share with you some more information on how to work with him to promote healing for yourself or others. Archangel Raphael is the physician of the angelic realm. You can call upon him for healing yourself and also for helping to find the inner guidance and inspiration to heal others. Raphael’s name means ‘God has healed’ He carries a cup of healing unguent. Essential oils of Anise Star and Lavender are used to contact Archangel Raphael. Lavender brings regeneration and heals auric damage, while Anise Star is used for consecration and gives protection from negative energies. His element is air and his planet is Mercury. Raphael’s day of the week is Wednesday. His crystal is Emerald and he works on the Green Ray. His direction is East and he rules over the physical Heart Chakra. Tree associated with Raphael are hazel, myrtle and mulberry, and good omens and signs that Archangel Raphael is responding to your request for healing at the sight of ravens or ibises, in fact most birds, or white feathers. Use green or yellow candles when working with Raphael for healing and expect speedy results, usually within seven days. Use pale green paper to write your healing request. Have you seen your Guardian Angel?